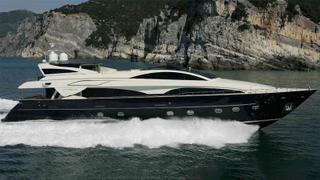 The 35 metre motor yacht Babousha has been listed for sale by Rytis Babravicius at Ocean Independence. Built in GRP to RINA class by Italian yard Riva to a design by Mauro Micheli, she was delivered in 2008 as one of the yard's Athena 115 series and refitted in 2016. Accommodation is for 10 guests in five cabins consisting of a main deck master suite along with two VIP suites and two twin cabins below, all with en suite bathrooms. Crew quarters aboard this yacht for sale sleep five members of staff. The saloon has the air of a gentleman’s club, with leather sofas and armchairs, coffee tables and an entertainment centre including a 43-inch plasma television screen. Another relaxation area is located in the large enclosed sky lounge on her aft flybridge. The rest of the flybridge has been designed for al fresco relaxation, including a comfortable soak in the Jacuzzi whirlpool spa tub. Her top speed is 28 knots and she boasts a maximum cruising range of 680 nautical miles at 24 knots with power coming from two 2,775hp MTU 12V4000M90 diesel engines. For increased safety and comfort, she is fitted with a gyroscopic anti-roll system. Lying in Greece, Babousha is asking €6,250,000 with VAT paid.